Product prices and availability are accurate as of 2019-04-17 09:16:11 EDT and are subject to change. Any price and availability information displayed on http://www.amazon.com/ at the time of purchase will apply to the purchase of this product. The Leviton 430801S1 is from the wallplates housings line. The Leviton singlegang and dualgang stainlesssteel wall plates always provide fieldconfigurable flexibility. The QuickPort snapin connectors and adapters support a variety of commercial and residential applications. 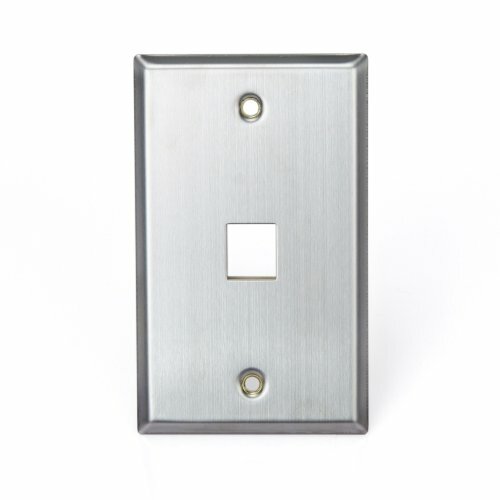 You can add an elegant touch to your home with Decora wall plates. They are available in several port configurations; the singlegang wall plate comes with 1, 2, 3, 4, or 6 ports, and the dualgang version comes with 2, 4, 6, 8, or 12 ports. You can use different colored QuickPort connectors and adapters for easy port identification. The installation process is fast and flawless. All Leviton wall plates are constructed to stand up to heavy use. We have many variations of wall plates that you can match to the color of your wall or wall plates.